Aimed at podiatrists, nurses, physicians, surgeons, orthotists and all other members of the multidisciplinary diabetic foot team, Managing the Diabetic Foot, Second Edition, remains a “must-have” for all those interested in diabetes and the diabetic foot. Michael E Edmonds MD FRCP, Consultant Physician, Diabetic Foot Clinic, King’s Diabetes Centre, King’s College Hospital, London, UK. Dr Edmonds is a world-renowned expert on foot problems in diabetes. He has lectured on the topic throughout the world and gave the inaugural Roger Pecoraro Lecture at the American Diabetes Association's annual meeting. He is also Chairman of the Diabetic Foot Study Group of the European Association for the Study of Diabetes. Alethea V M Foster BA(Hons) PGCE MChS SRCh DipPodM, Chief Podiatrist, Diabetic Foot Clinic, King’s Diabetes Centre, King’s College Hospital, London, UK. Alethea was involved in the development of the UK Government's National Service Framework for Diabetes which are being implement in all hospitals, clinics and primary care practices by April 2004. In May 2003, Alethea was the first podiatrist to be awarded the International Diabetic Foot Award, which is only awarded every four years to an individual who has played a pivotal role in developing diabetic foot care. Two per cent of the world's population have diabetes and of these, ten per cent will have a foot ulcer at any one time. Foot ulcers in diabetics are difficult to treat and very slow to heal. They result in more amputations than any other pathology. Severe ulcers are very debilitating, often require hospitalisation (half of all diabetic patients in hospital have foot ulcers) and can even result in death through complications such as gangrene and septicaemia. Foot problems in diabetic patients are very difficult to treat. Therefore visual recognition of presenting clinical signs is a vital component of early diagnosis and start of treatment. Treatment in this field is developing with the launch of 'synthetic' skin grafts such as Apligraf (Novartis). In the UK, the Department of Health published guidelines for the National Service Framework for Diabetes in December 2001. Alethea Foster was involved in the development of these guidelines. They are to be implemented in all hospitals/clinics/GP practices by April 2004 and call for 'proficient, rapid foot care for patients'. This book will reflect the changes resulting from the implementation of these guidelines. Although these guidelines are only those adopted in the UK, the book will have a global focus. The information presented will be relevant to anyone involved in treating diabetic patients. 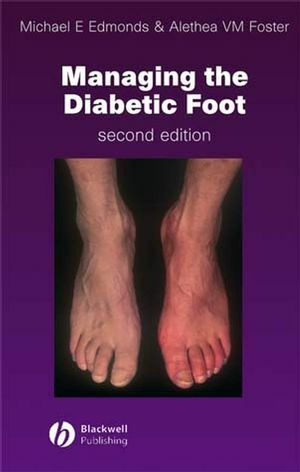 The previous approach to the first edition, incorporating numerous practical tips on the day to day assessment and management of the diabetic foot (which are not covered in any other diabetic foot books) will be expanded and made more formal by including an appropriate section in each chapter on practical management hints. Low-risk foot: new approaches to blood glucose control, lipids and blood pressure management, as demonstrated by recent landmark trials, will be incorporated. The use of statins, ACE inhibitors and anti-platelet agents all have new indications. High-risk foot: section on neuropathy will be expanded to include new approaches to neuropathy management (PKC inhibitor, Eli Lily drug) and management of painful neuropathy (gabapentin, Pfeizer). Ulcerated foot: notes on differential diagnosis will be added including squamous cell carcinomas and gouty ulcers which we have recently added to our collection: new approaches to management of ulceration including the VAC pump, Kerraboot (Ark therapeutics’ new product), the pulse compression boot, silver dressings, promogran, MPIs (metallo-protease inhibitors), maggots, and wound odour management with new therapies, will all be incorporated. New techniques of off-loading such as the PRAFO (Pressure-relieving ankle foot orthosis) and the knee scooter will be included, as will the time-honoured podiatric technique of adhesive felt padding. More practical details on manufacture and use of the Scotchcast boot for ischaemic ulceration will be covered. Infected foot: an expanded section on infection will include detailed consideration of MRSA and new resistant gram negative microorganisms. The very early signs of infection will be elaborated upon and osteomyelitis will be revisited. The use of MRI in the assessment of the infected foot to detect collections of pus and osteomyelitis will be discussed. New therapies including Linezolid (Pfizer drug) will be discussed. The necrotic foot: the vascular assessment and management will be updated including MRI and new angioplasty techniques such as sub-intimal angioplasty and outpatient day case angioplasty. Protection from contrast nephropathy will be discussed, highlighting acetyl cysteine and the withdrawal of dopamine therapy (no longer used, but discussed in the previous edition). New techniques of blood vessel closure following angioplasty, such as the perclose technique will be discussed. Implications of end stage renal failure will be covered in more detail. The unsalvageable foot section will be greatly extended to cover details of rehabilitation and prostheses. Throughout all the sections the educational element will be expanded. A new section on Charcot’s osteoarthropathy will be written to incorporate new approaches to diagnosis and management, including the CROW walker and reconstructive surgery. A new section will cover diabetic foot surgery. Managing Stage 1: The Normal Foot. Managing Stage 2: The High Risk Foot. Managing Stage 3: The Ulcerated Foot. Managing Stage 4: The Cellulitic Foot. Managing Stage 5: The Necrotic Foot. Managing Stage 6: The Major Amputation.